This was it. This was supposed to be the beginning of a new era of Kansas City Royals baseball, an era of rebuilding that would shape the foundation of the organization for not only the next few years but years beyond. 2018 was going to be the year we all look back on and see the outline of a master plan that would come to fruition around 2021-2022. Instead, we are sitting almost five months deep into the season wondering what the point of this season was. Dayton Moore has been preparing us for this rebuild for more than a year, knowing full well that the team would be losing a number of free agents after the 2017 season. He knew that financially it wouldn’t make sense to bring back the entire group and that it was time to move forward. That would normally mean allowing younger players to infiltrate the roster. But is that how it has gone down? Early in spring training the Royals went out and filled some holes on the roster with veterans, as they locked up Jon Jay, Lucas Duda and Mike Moustakas. For the most part there was “no harm, no foul”, as Kansas City didn’t spend much on any of the three while giving the team trade bait for later in the summer. For the most part that is how it has played out, as Jay and Moustakas have both been dealt and Duda is still a possibility to be traded later this month. So while these three have been taking up roster spots, they weren’t blocking a player who was ready to play in the big leagues. But there are some major question marks when it comes to a segment of the veterans still on the club and the amount of playing time they have been receiving lately. For example, over the last week or so we have seen Drew Butera make a couple starts at not only catcher but even first base. Yes, first base where he had started a total of two games before this season. Four starts in one week for Butera feels like a lot. The guy is a solid backup catcher and appears to work well with the pitching staff. Should he be starting at a position he has played at sparingly when you have two youngsters (Hunter Dozier and Ryan O’Hearn) who actually play the position fairly regularly? Probably not. I won’t go as far as saying it is hurting their development but starting Butera over them this past week felt like a real head scratcher. How about everyone’s favorite punching bag, Alcides Escobar? It’s hard to justify his playing time with a line of .204/.257/.283 and -0.9 fWAR and yet he is in the lineup more often than not. Adalberto Mondesi has shown that offensively he is an improvement over Escobar and defensively has been superior for years now. Yet over the two months since being recalled, he has only started 31 games in the field. 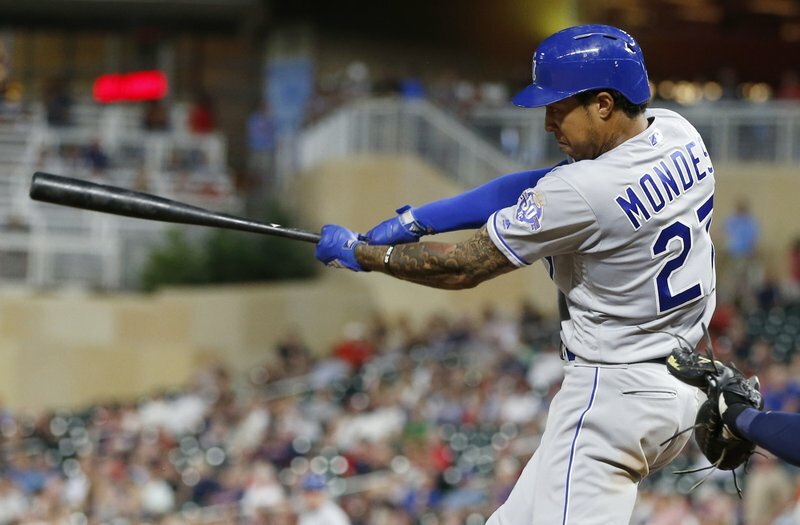 Out of a group of six rookies (which does not include Mondesi, since he passed his rookie status before this season) that have played for the Royals this season, they have compiled 527 plate appearances, or only 108 more than Escobar. Whether it is allowing these players to ease into the big leagues or just not giving them a bigger role, these prospects have not gotten the experience many of us expected them to receive as the season progressed. It’s been a slightly different story for the pitching staff, as a number of rookies have been given more prominent roles. Brad Keller has probably been the pitcher of the year for Kansas City so far, posting a 3.57 ERA, 3.64 FIP and 1.3 fWAR. The Royals rookie pitchers (ten in total) have thrown 346 out of the team’s 1033 innings. Keller and fellow Rule 5 Draft Pick Burch Smith have thrown the most out of the bunch, 88.1 and 60.2 respectively. Six Royals rookies have tossed 30 innings or more this year, including relievers Tim Hill and Jason Adam. It is hard to argue that the team is not giving some of the younger arms in the organization an opportunity to pitch this year when 4/5 of the current rotation are rookies. Then why does it feel like they could go even younger? The new “Black Hole of Death” appears to be in the bullpen, where Brandon Maurer, Jason Hammel and Blaine Boyer are taking up space. All three have struggled this year and have hurt the team on the field more than any value the rookies receive from their veteran leadership. It has been suggested that the club should cut bait with these three and give some of the arms in Omaha an opportunity…and at this point it is hard to argue with that reasoning. Is there any reason not to give Eric Stout or Trevor Oaks a longer look? Are control issues enough of a detriment to see whether Josh Staumont and Sam Selman can have success out of a major league bullpen? What about new acquisition Jorge Lopez? And how are we in the middle of August and there is still no sign of Richard Lovelady? In my eyes, it makes no sense to employ veterans like Maurer and Boyer when they just aren’t getting the job done. Give them a bus pass and lets see what some of the inexperienced arms can do. Maybe my expectations were off course, but by this point in the season I presumed that the Royals would be employing one of the younger rosters in the league. Instead, they still feel really…old. By no means do I expect this team to be a cavalcade of 20 year olds, but I did expect the focus to be on the future. Instead, it feels like they are treading water. Not every prospect is going to be ready and there is an appreciation for allowing them to develop at their own pace. But if the Royals are to contend again around 2021 (and that is the expectation in the front office) then they need to speed this process up. Giving at bats to Alcides Escobar or allowing Brandon Maurer another day on the roster isn’t helping anyone. For this to be a real rebuild, the Royals need to quit straddling the fence and move forward with players who could still be in Kansas City three years from now.